I knowingly skipped over my third blogiversary, or however it's spelled, because I felt that my neglected blog didn't deserve any hoopla at the time. 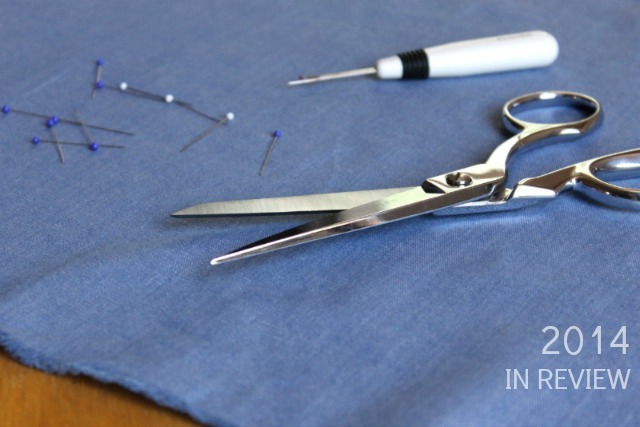 As the year 2014 rolls to an end, though, I thought I should revisit this space to catch up and do a bit of reflecting on the past year of sewing in general. If only to distract myself from thinking about the impending nightmare of filing my taxes as a self-employed person for the first time. And I've certainly missed you all! 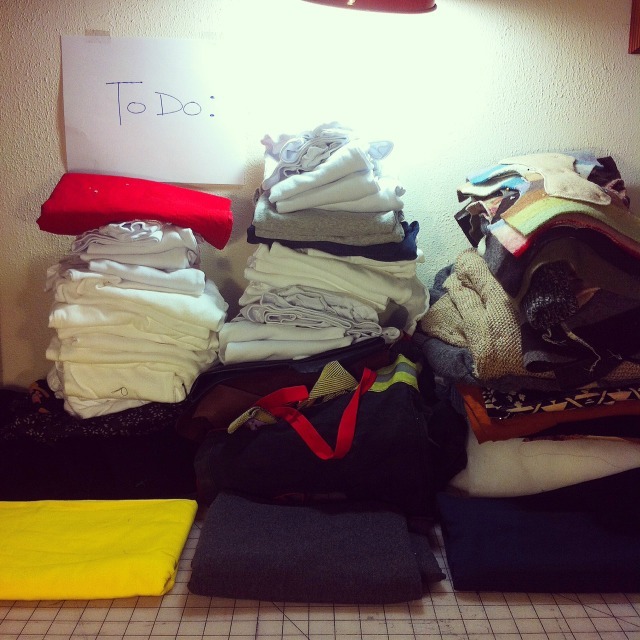 As you may know (from this blog post), in February I quit my position as a grant writer in order to sew for a living. For awhile after that I was mostly sewing for a studio that did bridal alterations and custom projects. The owner ultimately decided to narrow her focus and cut down the volume of her workload, so I stopped working there in early September and ventured out on my own. 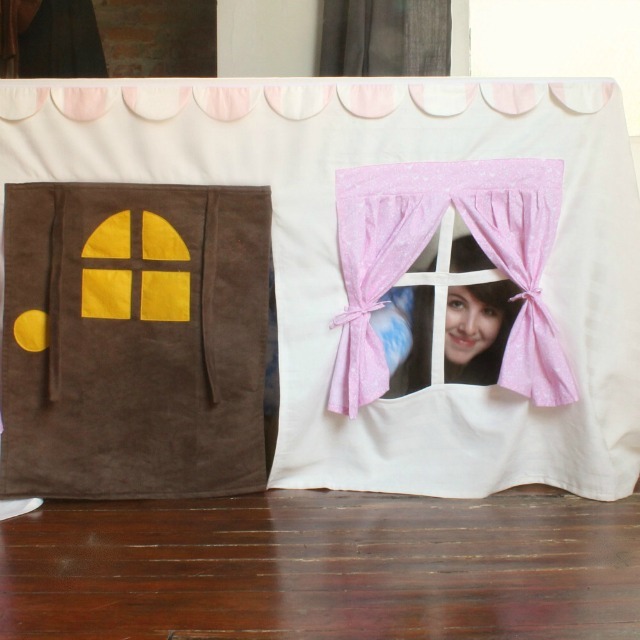 One of my last projects at Seamstress for Hire: a tablecloth playhouse. Naturally I had to try it out for myself. Since then I've been freelancing, sewing on-demand for a few Etsy shops and local brands (Rebourne; Cuddle Sleep Dream; Brynnie). The work is consistent and I get to work from home on my own equipment, which is excellent in that I can set my own schedule and I certainly enjoy the autonomy and pajama dress code. But it also means that my small sewing room is in a constant state of chaos and I never know how to stop working because the work is always staring at me. I have also been teaching more often at Butcher's Sew Shop, leading the Sewing with Knits workshop as well as some sections of Sewing 101 and 201 and private lessons for adults. In the past I never imagined myself being any sort of teacher due to my introverted nature, but teaching people how to sew has been incredibly fun. I'm lucky that Butcher's is a laid-back and warm environment, and it's rewarding to witness the students' proud moments of finishing a new project. I've learned that patience and encouragement (...and being able to multi-task like kRaZy...) go the longest way as a sewing teacher. If you're interested, you can read more about the talented owner of Butcher's on Madalynne's blog here. 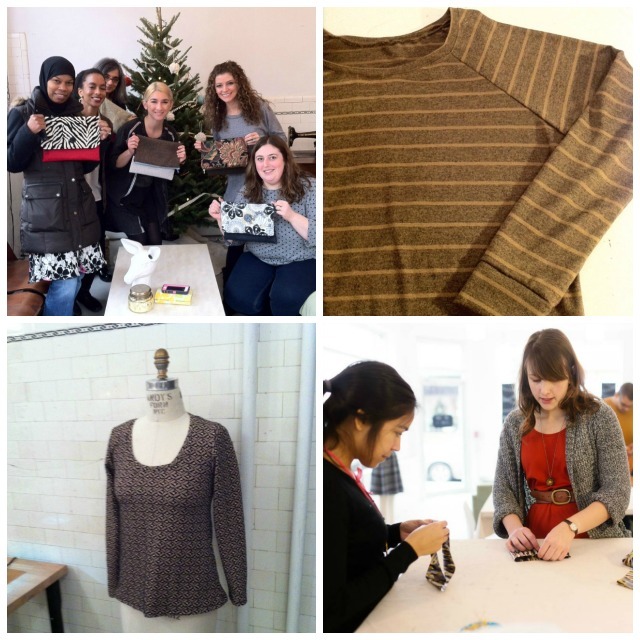 Clockwise from top left: Sewing 101 students with their finished clutches; a student's Linden sweatshirt from my Sewing with Knits class; me with a student in Sewing 201 working on the Salme Kimono top (photo by Maddie found here); and a student's finished Deer & Doe Plantain tee. The rest of my time is spent doing custom projects and alterations. I'm trying to shy away from this type of work when possible because it takes a lot of (unpaid) time to meet with people and do fittings, and the work can be unpredictable. The majority of these type of clients so far have been friends or people I know, though, which is certainly more enjoyable that way. 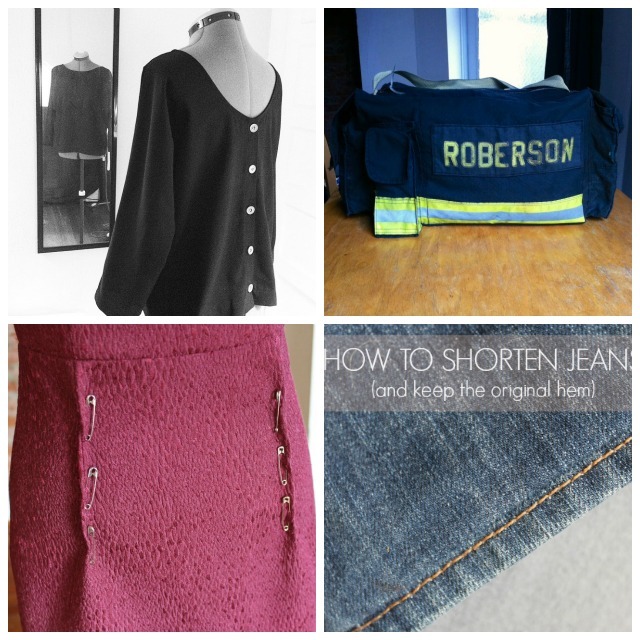 Clockwise from top left: Custom button-back top for my friend Charlotte; duffel bag made from firefighter gear for a retired fireman; a Craftsy post I wrote on hemming jeans (quite a controversial subject according to the comments); and a flat tummy adjustment in progress on a RTW dress. My hobby sewing (and blogging, as you know) has slowed considerably, but I have cranked out a couple easy things for myself in the wee hours. I did sacrifice a whole work day and made hedgehog costumes for Corey and me for Halloween. (People thought we were lions.) I also took time where possible to make birthday and Christmas gifts for some dear ones this year. 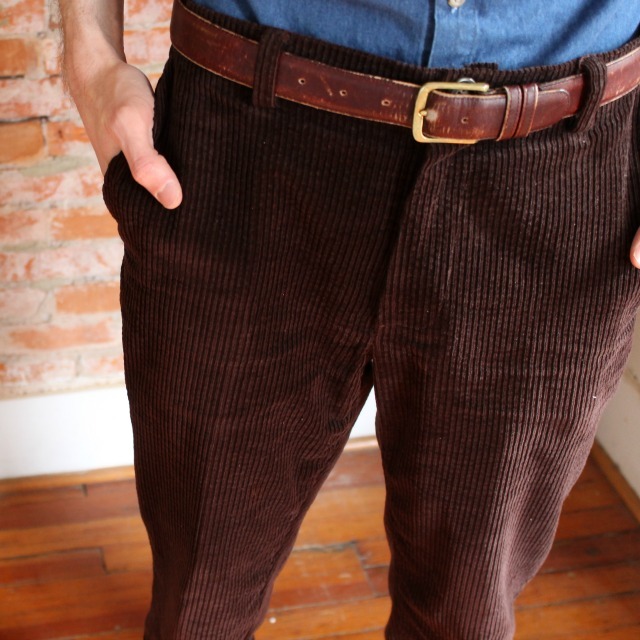 Above: wide-wale corduroy pants I made for Corey's birthday. I used the Thread Theory Jedediah Pants pattern, which fits him perfectly with no modifications. He wears these cooooonstantly! 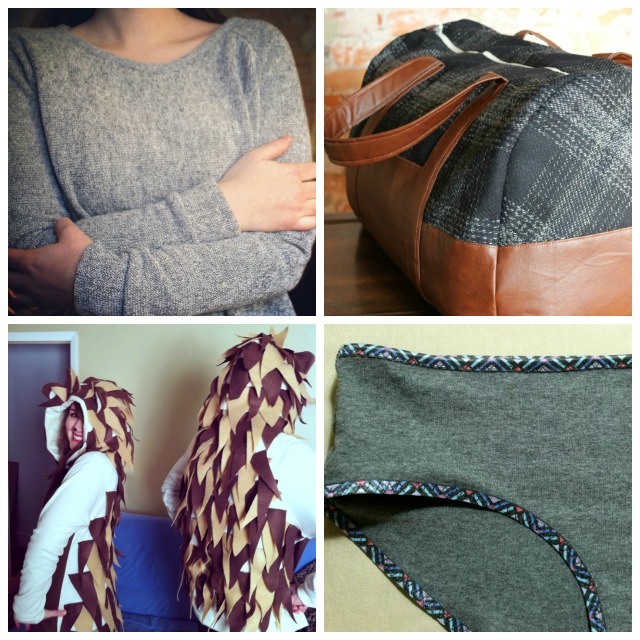 Favorite makes this year, clockwise from top left: Linden sweatshirt for myself in a loopy sweater knit; Portside duffel bag I'm obsessed with (I replaced that white zipper with a gold metal one and it's bangin'); Several pairs of handmade underwear because I hate shopping for anything anymore; Hedgehog costumes made from fleece and a ton of felt triangles. 2014 has been a truly bonkers and amazing year. I almost can't believe this is my life now. I certainly do not miss working in the office environment and never for a moment have regretted my decision. Working for myself of course comes with its own stressors, like unreasonable deadlines, taxes, business licenses, expense tracking, clutter!, picky clients and 15 hour work days where I don't leave my house. I work about 70 hours a week and earn less than half the income I had at my office job. But! I feel as though I own my stress because I can decide what work I'm taking on in the end. It's taken me awhile to build confidence and I still get frustrated at myself for making dumb mistakes or taking too long, but I've more often been proud of myself than anything for what I've done so far. So here's to another bonkers and amazing 2015. Happy new year, friends, and I will see you on the other side!